Malpua: Malapua is a pancake served as a dessert or a snack. There are several variations, using the following ingredients: maida (all purpose flour), milk. The batter is left to stand for a few hours before being spooned into a pan of hot oil to form a bubbling pancake which should be crisp around the edges. The pancakes are then immersed in thick sugar syrup. 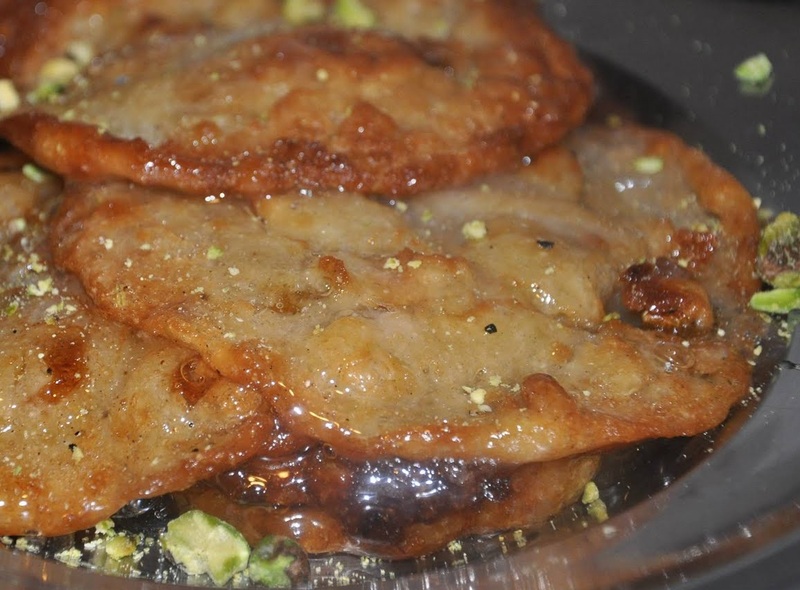 Malapua is a popular sweet to make on the Hindu religious occasion of Holi. Malapua is served at the Jagannath Temple as Sakala Dhupa (Morning food served to the lord). Bring the milk to a boil, on medium heat. Simmer the milk till it reduces to 1 1/2 cups. Remove the milk from heat and allow it to cool to room temperature. In a bowl, add khoya with half of the milk. Add in the green cardamom powder, fennel powder, sugar and salt. Add in half of the flour. Mix well till there are no lumps. Slowly add the remaining milk till it forms a smooth flowing batter. Note: If more milk is required to make the malpua batter, do add more. Add milk as required for a flowing batter. If the batter has become too thin, you can always add a few tablespoons of flour to thicken it. Set aside till you make the sugar syrup. To prepare sugar syrup, add sugar and water in a stainless steel vessel. Melt the sugar and cook the sugar syrup for 10-12 minutes on low medium flame. Remove the ssugar syrup from heat. Heat the oil in a pan on low medium flame for 3-4 minutes. Pour a small ladle full of batter in the center of the pan without spreading it. Do not try to touch the pancake till it starts to turn golden along the edges. It will slowly get immersed in the oil and cook on medium flame till the sides are golden brown. Flip it over and cook on medium flame for another 2-3 minutes or till it turns golden brown. Fully immerse the Malpua in the sugar syrup and let it sit for half a minute. Remove with a slotted spoon such that the sugar syrup drains off the Malpua and then place it on a serving plate. Spoon some rabri on top of the malpua and garnish with pistachios and almond slivers.